But admittedly, since the opening, it’s been hard to convince myself it’s worth waiting in line to get into any of the establishments. At peak times, the boathouse can be so crowded, you’ll barely be able to hear yourself think. Ain’t nobody got time for that! Luckily, my friend and I know a place nearby that’s quiet, exclusive, and there’s hardly ever a lineup. Chabugama is a quaint little udon restaurant located right outside the parking lot entrance to Ohori Park, near the Boathouse. 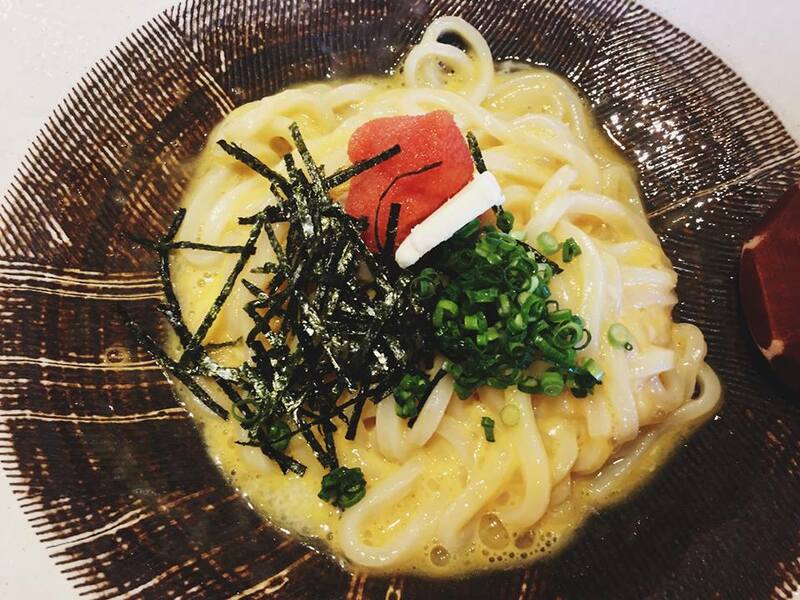 Their specialty is udon, BUT WAIT, DON’T LET THAT SCARE YOU OFF! If your image of udon is anything like mine, it’s probably cheap broth and fat noodles with hardly any substance. If you’ve ever worked in a Japanese highschool, or been a student in Japan, you might even associate “udon” with the cheapest thing on the menu at the school cafeteria. If you can’t tell, I’m not actually a fan of normal udon either, but let me tell you, Chabugama‘s udon is on a different level. This isn’t the stuff you throw your leftover curry in. When looking for a quick and easy lunch that’s filling and satisfying, Chabugama‘s Mentai Butter Udon is my absolute fave. A lot of non-Japanese are turned off of ever trying mentaiko simply because of it’s description; Why YES, it IS cod fish roe, and NO, you WON’T see it in Western Cuisine, but if you ever wanted to dip your feet into the fascinating world of Mentaiko Ryouri, this is one of the most accessible and pleasant ways to try it. 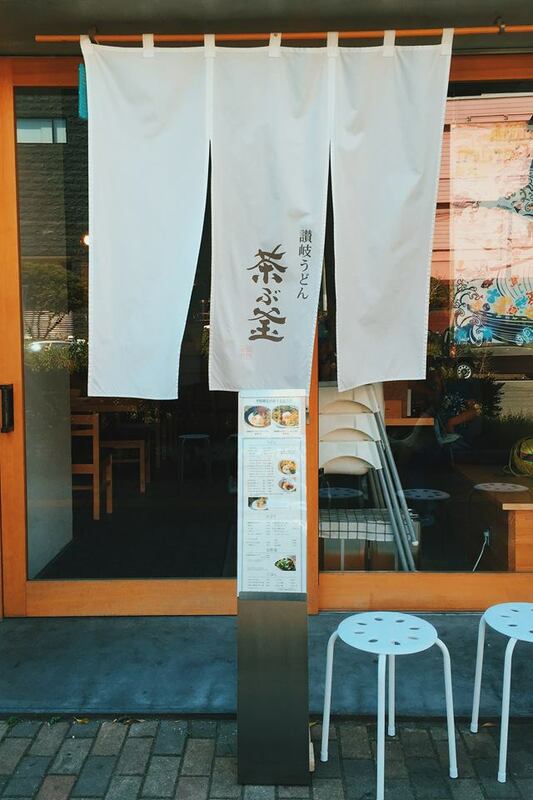 Mentaiko IS, after all, one of Fukuoka’s specialty foods, and to go home without ever learning to fully love and embrace it would be a frigging crime–ask your mom! Mentaiko is actually more spicy than it is fishy, and the butter udon’s soup base is thick and creamy, stir up that tiny dollop of fish-eggy goodness and add soy sauce for added seasoning if needed, and the flavor won’t be too offensive or overbearing. It’s definitely a lot easier for beginners than eating a bite of seasoned mentaiko as it is. 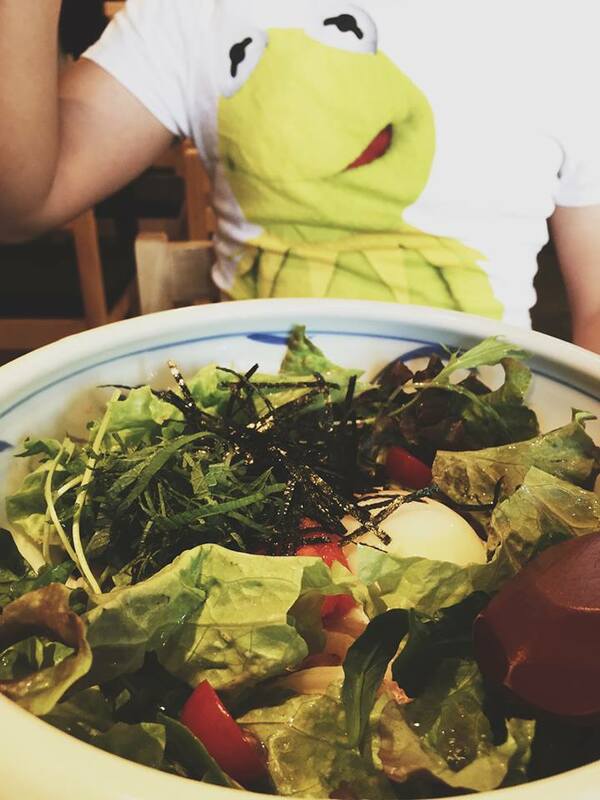 Believe it or not, there IS udon under all that salad. Believe it or not, I forgave my friend for their horrendous choice of t-shirt. The other seasonal offering at the moment is a Chinese sesame tan-tan style noodle soup base, and aside from “specialty udon”, they do serve their own variations of traditional (read: basic) styles of udon as well. 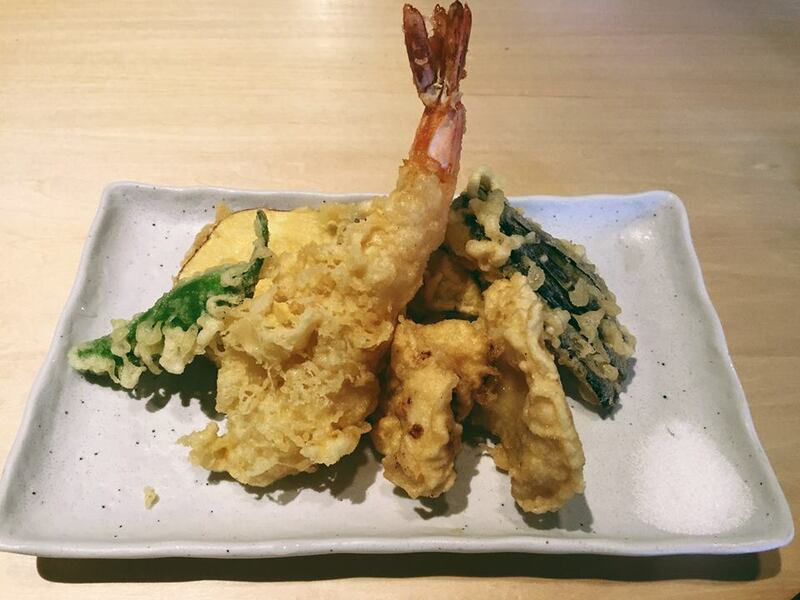 The side-menu is limited to tempura, salad, onigiri, and mini-beef bowls, but my friend and I always order tempura to share between the two of us, and find that, when paired with a bowl of udon each, it’s very satisfying and filling for lunch! (just kidding nobody actually calls it tempura juice). Anyway, if you’re coming to Ohori Park to enjoy the sunny weather this summer, but would like to try something a little more traditional than the flashy westernized restaurants in the park, take a stroll over to Chabugama and take a look at their menu. If you’re only visiting Japan for a short little while, it’d almost be a shame NOT to sit in here and absorb the atmosphere. If you’re still hungry, you can always grab Pinkberry or Starbucks and sit in the park for dessert! With the weather being as nice as it has been lately, I feel like I’ve been wanting to spend as much time in this park as possible. But really, if you’re going to the park to enjoy the weather and the scenery, it seems counter-productive to spend the majority of that time queuing for food, doesn’t it? And let me know if there’s anything in particular in Fukuoka that you’d like me to blog about in the future! Posted in Asia, オススメ, ランチ, レストラン, 福岡, Dining, Food, fukuoka, japan, Japanese Food, Life, Local, Ohori Park, Tourism, Travel, 大濠公園Tagged Asia, うどん, めんたいうどん, ジャパン, ミカエラ, Chabugama, ciaela, 福岡, 福岡オススメランチ, 福岡グルメ, English, ESL, 英語, 英検, 茶ぶ釜, fukuoka, Fukuoka Lunch, japan, japanese food, Kyushu, Lunch, Mentaiko, Micaela, Micaela Braithwaite, Ohori Park, Ohori Park Lunch, restaurant, Tourism, travel, Udon, 大濠公園, 日本, 日本語, 明太子, 九州Bookmark the permalink. Great article – BTW, did you see that United Airline’s magazine listed Fukuoka as one of the world’s next great cities? I’m interested in seeing more about the iwashi mentaiko and the street stalls, but I can skip on the motsunabe. I never really cared for that very much. Motsunabe is kind of funny because everyone who comes to Fukuoka wants to eat it, but people who live in Fukuoka don’t eat it that often– at the end of the year all our “year-end parties” were at Motsunabe places and I got really tired of it. Haha. I am studying English now. But it is hard for me,because there are no foreign people around here. I watched your YouTube. It was very fan and interesting. I met a Canadian girl yesterday. She came here for sight seen. I can’t speak what I want say, because we speak English. I wanna speak English fluently. I am going go see your YouTube every day . Thank you. Reblogged this on Driago Olinde. It’s a shame that I’ve never seen you as a travel blogger and YouTuber before! But thanks to Japan Times for featuring you today. 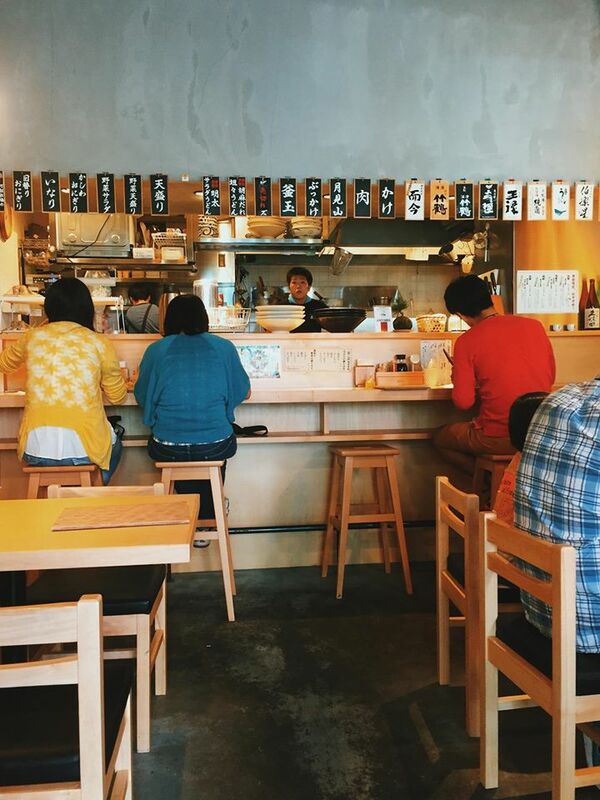 I love reading blogs about Japan. This place will be on my hit list come November. Thanks! Hi Micaela, how are you? My name is Flávio, and i appreciate so much your work! I watched some videos in your channel and my favorites is the ones that you give motivation to people, and you talk about the hard times you had to lear japanese. I lived once in japan for 3 years when i was 15, but i never learned japanese because i just worked in japan in factories all the time all the day… so when i was 18 i return to Brazil where i live and started the university in the course of administration. Actually im 28 and recently i got a job in the Bank of Brazil here in São Paulo(state), but my family is from Curitiba(the city of other state). Sometimes i visit my parents there when its holiday! (São Paulo to Curitiba is about 400 km its a pretty long distance =/). I was thinking it could be really nice if one day you want to visit me in Curitiba when i go there, actually i live in São Paulo but here is so crowded and i dont know so much about the place beucause started to live here just about 5 months ago. Curitiba has a lot of cool places to go, sometimes i used to run in some parks there: Barigui Park; Botanical Garden are the ones that i prefer. Here in Curitiba has some shoppings centers very big and very cool with good restaurants like Outback(good hamburgues and steacks), i dont know you know… I used to go to a Japanese Club there too, place where i used to play table tennis… I mean that here we had a lot of cool things to do! My english is kind of a crap, but if one day you want to visit me and i have some difficults to understand you, my mom have a fluent japanese and my brother have an almost fluent english, recently he opened a little english school near the house. By the way, i want to say again i really appreciate your job, the way you see Japan is so great and it is so admirable.